As a practical and nontechnical resource, this guide allows the reader to achieve high productivity and profitability by providing vital information on how to improve quality products and services. It will serve as an invaluable aid to quality assurance managers and specialists; consultants; quality assurance professionals in private or public business and government; and engineering, management, and statistics students. Offers prototype procedures that can be adapted to any type of business. Covers all life phases of the system: design, implementation, and maintenance. 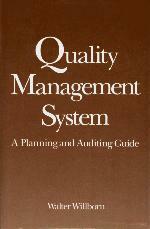 Allows readers to assess current needs and strengths and weaknesses of quality assurance practices. Addresses managers in all kinds of industries. Presents modern developments in quality assurance management in an immediately applicable manner that does not require extensive study in quality control. Enhances important material with checklists and standard forms. Preparing for Planning Quality Assurance. Designing the Quality Assurance System. Quality Assurance Procedures: Subsystems. Implementing the Subsystem. Auditing the Quality Assurance System. Cases. Appendices. Index.